In the mid-1800s, a wave of immigrant millworkers practicing many different faiths came to Norwich. The Irish Catholic immigrants established St. Mary’s (192 North Main Street) the first Roman-Catholic church in Greeneville. 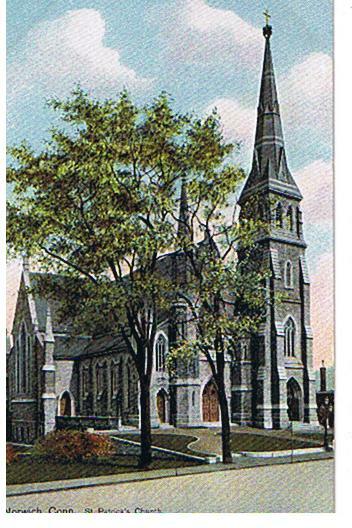 Soon, the small catholic church became overcrowded and the Irish Catholics from Greeneville funded the construction of St. Patrick’s Church, which is today the Cathedral of Saint Patrick. The site for their new church was conveniently adjacent to the homes of the wealthy millionaires in Norwich who often employed Irish servants. On the morning of Good Friday in 1873, the Irish marched from Greeneville with picks and shovels and dug the foundation of the church by hand. The first cornerstone was laid in July 13, 1873, and parishioners paid 10 cents a week for the construction of the church. 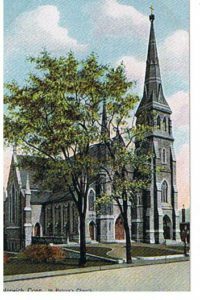 St. Patrick’s would claim to be “the finest parish church in New England.” The formal opening and dedication for the new church were held on September 28, 1879. The building suffered some damage during the Hurricane of 1938. In 1952, the church was consecrated as the newly formed Diocese of Norwich.